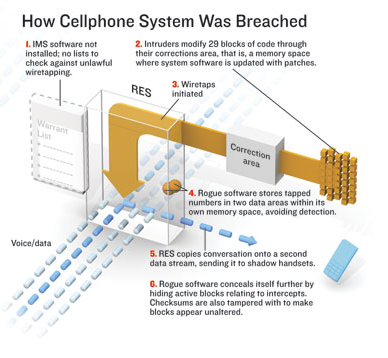 IEEE is running a fascinating article on a discovered intrusion into major Greek cellular networks for the purpose of engaging in unauthorized eavesdropping of prominent officials including the Prime Minister and his wife. In a world where credit card thieves and low-level hackers get all the headlines, security professionals should make special note of the sophistication of this attack. On 9 March 2005, a 38-year-old Greek electrical engineer named Costas Tsalikidis was found hanged in his Athens loft apartment, an apparent suicide. It would prove to be merely the first public news of a scandal that would roil Greece for months. The victims were customers of Athens-based Vodafone-Panafon, generally known as Vodafone Greece, the country’s largest cellular service provider; Tsalikidis was in charge of network planning at the company. A connection seemed obvious. Given the list of people and their positions at the time of the tapping, we can only imagine the sensitive political and diplomatic discussions, high-stakes business deals, or even marital indiscretions that may have been routinely overheard and, quite possibly, recorded.